The collection and analysis of data on concussions and treatment services is a key element to better understanding the profile of patients with concussion, their clinical needs and the impact of concussion care they receive. This work also identifies gaps in the system in regards to access to care that need to be addressed. 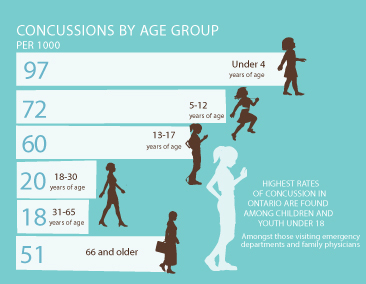 The Ontario Neurotrauma Foundation has commissioned a number of studies and surveys in order to characterize concussion incidence and concussion care through the province and investigate what needs optimization. Through studying the state of concussion care in Ontario, ONF and partners uncovered gaps in access and care throughout the province. Our studies have discovered a variability in service models, available expertise, and multidisciplinary mix of staff in brain injury and sports clinics. The majority of clinics serving people with concussions were not providing the full range of comprehensive services needed to address the recovery and needs of those with concussion. The study also reviewed wait times and access to care. In the Summer of 2016 ONF funded a follow-up study conducted by the Institute for Social Research at York University, again to characterize the current state of concussion care. This study focuses on the clinics who provide concussion services, the range of services they provide, the disciplines represented in their clinics, and the patients they serve. To see the presentation on the study, please click here. Building on the success of past work and the keen interest of clinical, patient and research experts, the Ontario Concussion Care Strategy (OCCS) has been developed to facilitate data collected on concussions and concussion care becoming more consistent across the province. The Ontario Concussion Care Strategy (OCCS) is a project we are undertaking in partnership with St. Michael’s Hospital and other centres, involving common data elements for concussion and implementing their collection at a variety of sites across the province. To read more about the OCCS, please click here. ONF co-funds the largest concussion study in Canada, in partnership with the Canadian Institute of Health Research (Institute of Neuroscience, Mental Health and Addiction). The study, more simply known as 5P aims to develop a clinical prediction rule for post-concussion syndrome in children presenting to the emergency department following concussion. To read the project summary, click here.